9-266Q system, Venal region. 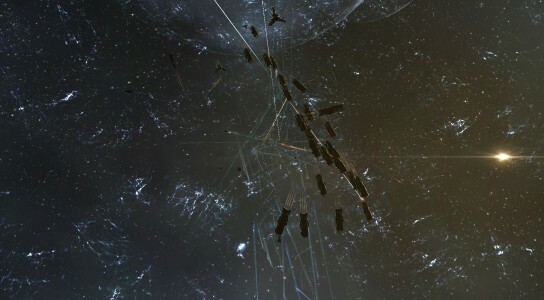 On the 9th of March at 21:00 EVE Standard Time, Imperium forces engaged local residents and allies over a tower in the region. The tower war in the Venal region between Out of Sight. [OOS] and the Imperium continues in earnest. This time Out of Sight. and allies had reinforced a tower belonging to Circle-Of-Two [CO2] in the D-8SI1 system and the two sides were preparing to fight over it. Circle-Of-Two had assembled a 150 pilot Eagle heavy assault cruiser fleet and was traveling to the D-8SI1 system when its scouts reported on hostile fleets converging in on it. The fleets in question were an Out of Sight.\Hax. [HAX. ]\The OSS [OSS] 50 pilot Typhoon battleship fleet and an 85 pilot Pandemic Legion [-10.0] Proteus strategic cruiser fleet who managed to reach the Eagle’s fleet destination beforehand, effectively cutting it off from the system and forcing it to stop in the 9-266Q system. Not wishing to contend with the two fleets head on, the Eagle fleet quickly retreated to a safe tower in the system while calling for reinforcements. Nearby Imperium alliances heeded the call and formed a 100 pilot Augoror Navy Issue cruiser\Zealot Heavy assault cruiser fleet which burned to the system. 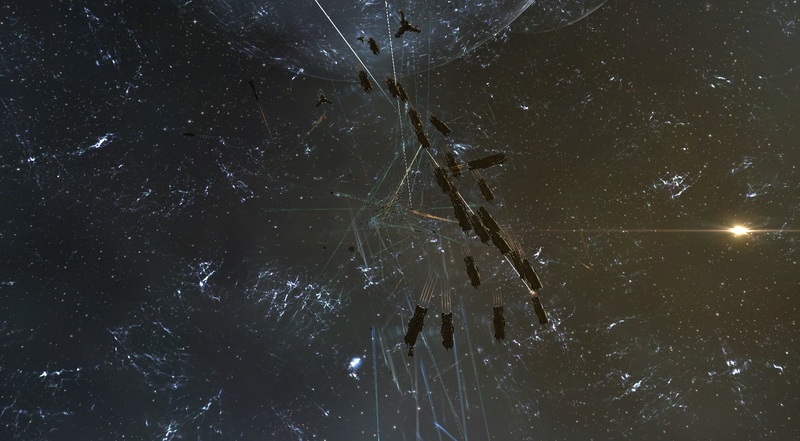 The two fleets quickly settled on the N6G-H3 gate and waited for hostiles to engage them. The Typhoon fleet took advantage of the fact and quickly destroyed the Circle-Of-Two tower which had come out of reinforced mode before bridging into the N6G-H3 system on the 9-266Q gate. At the same time Pandemic Legion entered the 9-266Q system and warped to a perch on the grid, joined now by a 120 pilot Low Sec Voltron (LSV) Cerberus heavy assault cruiser fleet, which had also pinged on the grid. With the allies ready, the Typhoon fleet quickly jumped into the system with 3 triage carriers in tow while the Pandemic Legion fleet warped in between the two hostile fleets as the Cerberus fleet quickly landed at long range of the Imperium fleets, all 3 fleets anchoring up and engaging Imperium forces immediately, starting the battle proper. Imperium forces concentrated fire on the Typhoons while the allies split their focus between the two fleets, the Typhoons targeting the Imperium reinforcement fleet while the Proteus and Cerberus fleets targeted the Eagle fleet. Pandemic Legion also dropped two triage carriers on the field, which soon proved unneeded as the enemy fleets continued to target the Typhoons, ignoring the strategic cruisers and the heavy assault cruisers present on the field. 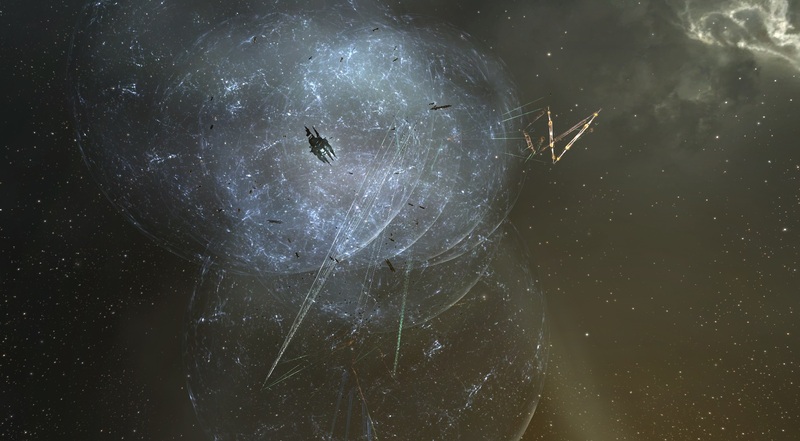 The two sides fought at close range except the Cerberus fleet which maintained its position away from the maelstrom, kiting at the edge of the battle. For the allies it was a welcomed chance, as the Cerberus fleet simply volleyed the logistics wing of the Eagles with flight after flight of missiles while the strategic cruisers simply overwhelmed the Eagles themselves at close range, the Proteus strategic cruisers tackling many of the Eagles and shutting down their micro warp drive engines, making them sitting ducks. This led to mounting losses for the Eagle fleet as the battle raged on. As this was going on, the Imperium fleets were hard at work decimating the Typhoon fleet. Battleship after battleship evaporated even at the face of the triage remote repairs present on the field. However as the battleships went down, so too did that Imperium’s mainline ships at an increasing rate, the trade off between the sides growing exponentially worse for the Imperium. By now the Eagle fleet had suffered heavy casualties and was attempting to flee. Thanks to a good maneuver by one of its command destroyers, the Imperium was able to teleport a sizeable chunk of the Pandemic Legion fleet away from the fight. This however turned out to be merely a brief reprieve, as the strategic cruisers simply burned in again, continuing to inflict losses on the Eagles as they closed the distance. Unable to tank the incoming damage and managing to inflict less and less losses on the Typhoons, the Eagle fleet attempted to withdraw, warping whatever ships it could off the field and abandoning its reinforcement fleet to fend for itself. The Augoror Navy Issue cruisers and Zealots soon found themselves hammered on all sides by the allied fleets, who simply proceeded to tear them apart. In rapid succession, Zealots and Augoror Navy Issue cruisers were volleyed off the field, the fleet’s logistics wing barely holding a few of the ships alive while being pummeled by the enemy fleets and losing Guardian and Oneiros logistics cruisers as well. Unable to break the tank of the enemy fleets and losing ships at an accelerating rate, all that was left for the fleet was to attempt and clear its aggression timers while burning to the N6G-3H gate. The allies continued to fire regardless, picking off mainline ships as the few survivors jumped out and warped off, leaving the field for the allies to loot. For the allies, with the field secured and the last stragglers dispatched, it was time to return to their respective staging systems, having won both the field and the objective. Thus hostilities in the system came to an end. Battle report for the 9-266Q system can be found here. All told the battle lasted 40 minutes with Time Dilation spiking at one point to 70% but subsiding quickly. The system hosted 560 pilots at the height of the fighting. 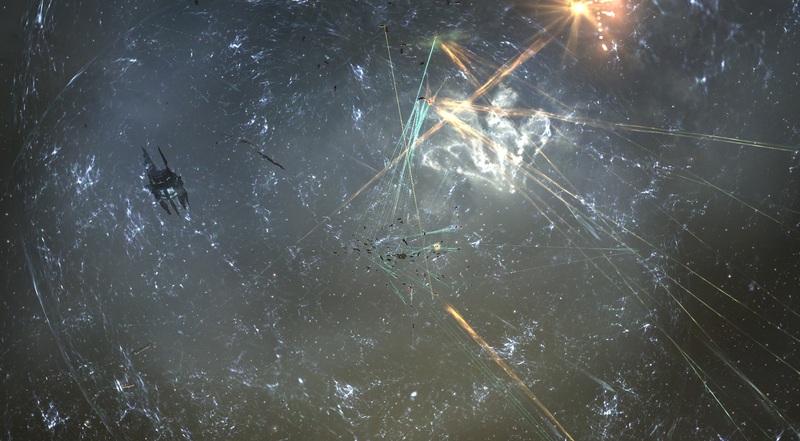 Allied forces lost 55 ships in the fighting, including 20 battleships and 1 heavy assault cruiser for a total of 8.29 billion ISK damage. 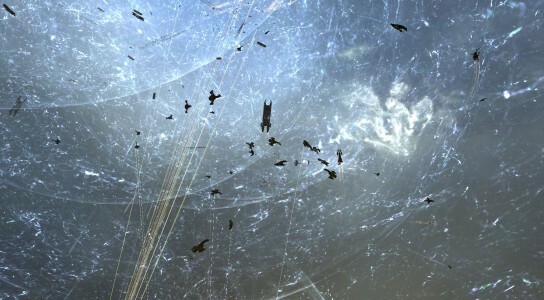 The Imperium lost 108 ships, including 54 heavy assault cruisers and 18 cruisers for a total of 26.54 billion ISK damage. Simply want to say your article is as amazing. The clearness for your publish is simply spectacular and i could assume you’re an expert in this subject. Fine together with your permission allow me to grasp your feed to keep updated with impending post. Thank you a million and please continue the enjoyable work. I want making my very own songs blog site as well as I’m frequently browsing numerous music blogs throughout the day finding new music initially prior to other people that I know. Yet just how specifically do those blog sites discover that songs first? Can I really begin by simply publishing the songs I locate on other blogs?. I’m aiming to learn as much about the on-line surfing area as I can. Can anybody suggest their favored blogs, twitter handles, or websites that you discover most extensive? Which ones are most popular? Thanks!. Useful information. Fortunate me I discovered your web site accidentally, and I am shocked why this twist of fate did not happened earlier! I bookmarked it. Hey there, You’ve done a fantastic job. I will definitely digg it and personally suggest to my friends. I’m confident they will be benefited from this web site. I am looking both for blogs that provide unbiased, well balanced commentary on all issues or blogs that have a liberal or left-wing slant. Thank you.